Getting into the rhythm, getting rid of the blues. Having a baby means a complete rehaul of your (well at least my) daily rhythm. The newborn baby dictates your rhythm, not the other way around. My dearest RK is one month old today and, boy, do we have a steep learning curve. In his early days, he slept a lot and demanded lots of breastmilk. In between that, he peed and pooped a lot as well. Sleepless nights have been the norm since the baby was born. Every second was a race: when RK took his naps, I had to take shower/eat/do the laundry/iron/wash the dishes/take a nap as fast as possible. As suggested by the pediatrician, Yoga and I had decided to exclusively use one-layer cloth diapers in RK’s first month. Not only it is healthier for RK and cheaper for the parent, it enabled us to know exactly how much he peed and pooped — important parameters of his health in his first month. However, that decision means we have to wash more than a dozen cloth diapers and swaddle clothes each day. We don’t have washing machine so we (mostly Yoga) have been doing RK’s laundry by hands. Before the baby’s arrival, we sent our dirty clothes to the laundry-by-kilo shop (we still do), but the baby’s dirty clothes is our business, of course. We’re lucky to have strong support system. Yoga could take a month leave from the office — not paternity leave, mind you, he got five days of those but thankfully he’s earned 2 months of leave, a “gift” after working for 5 years in his office. My mom stayed with us in the first week to help washing and ironing the baby’s clothes. Yoga’s mother kindly sends us food everyday so we don’t have to cook on our own. Nevertheless, the first month has been very exhausting. In addition to the sleepless nights (or at least much less sleep than pre-RK days), there were neighbours, friends, and family who came to the house to welcome the baby. They came with good intentions (and wonderful gifts), of course, but all those subtracted our limited rest time even more. Add baby blues into the mix and things get somewhat uglier. When I was pregnant, I’ve read all about baby blues — how hormones trick most new mothers to be very sad after delivering the babies. Some stat say 8 out of 10 new moms get the baby blues. I wished I would be one of the lucky 2 mothers, but heck, unfortunately that was not the case. I first felt that extreme sadness in my first night home, after coming back from the hospital. Then for about a week, I cried every day for seemingly pointless triggers. Once it was because my ATM card was blocked since I input the wrong PIN numbers into the machine, another was actually extreme happiness when I first saw the baby’s sweet, sweet smile. The heaviest episode of crying, perhaps last about an hour, started when I was washing the laundry and felt that I had stuck in the endless cycle of breastfeeding-washing laundry-taking care of pees and poops. I am grateful that Yoga was there to help do the chores and comfort me, ensuring me that I was not alone in facing all those baby blues and dirty clothes and pees and poops. He hugged me tight and listened to me (hints for husbands with wives with baby blues!). He’s also a good cook and good food can do wonders to stressed-out moms. 🙂 Meanwhile, I kept reminding myself that baby blues would be just a phase, and a short one, so everything would be okay. The blues disappeared after a week. I still cry once in a while when I’m upset, but I know it’s very different. With baby blues, it was just sadness and more sadness, I even cried when I read about baby blues in the internet. It may sound silly but when you’re at it, damn, the world seems simply like an ocean of sadness and melancholy. When I’m upset and I cry, it’s just like before RK’s birth, a short episode with no drama (to be honest, I’ve always been a crybaby and easily cry anyway, although not in public places hahaha). After a month, we’re somewhat more relaxed in taking care of the baby. I mean, in the first week, we rushed to RK everytime he cries, and tried to change his diapers as fast as we could. Now when he cries we don’t rush things any longer. Not that we neglect the baby and let him cry his heart out, but we turned the tempo to be slower than before. RK’s also sleeping better at night now, giving us 2-3 hours intervals between cries of breastfeeding/peeing-so-change-his-diaper-please time; much better than those nights when he was awake and breastfeeding/peeing from midnight to 6 am. To keep track of everything, from breastfeeding to pees and poops to sleeping hours, I use Feed Baby application on my cellphone and so far it’s very helpful. 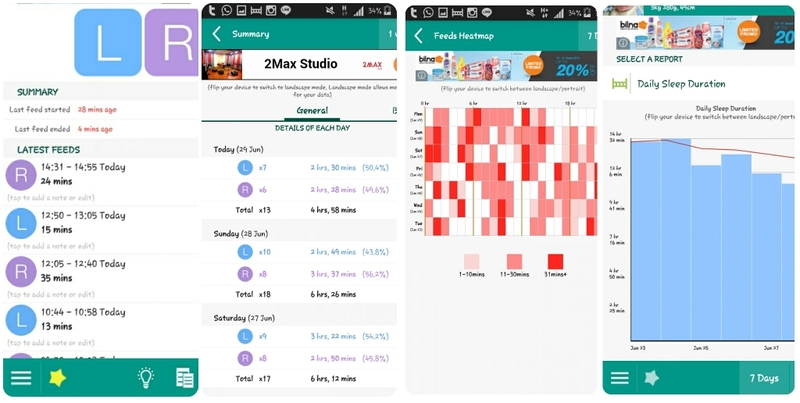 The app comes with trackers of those activities and more, such as breastfeeding heat maps, sleeping charts, growth charts, etc. Now we know RK’s habits better. If only the app does not eat so much of the battery, I would give it five stars. Anyway. All the exhaustion seems to evaporate whenever we see him smiling. I always feel my heart melts everytime RK smiles. Having a baby changed our lives for good and gives us a different set of happiness — not necessarily happier than before, perhaps just that, a different set of happines than pre-baby days, but still, I’m happy we’re happy. I’m happy he’s healthy, and hopefully, he’s happy, too. Makasih Na, we love you too! Setelah jadi ibu beneran baru kerasa betapa kurang berterimakasihnya aku sama ibu sendiri. Huhuw.